Fish see food the same way a computer algorithm “sees” things: They look for patterns. In the case of fish, they look for patterns that give them clues that something is food. Pattern matching allows fish to eat something even if it looks different from what it usually eats. As long as it has a certain size and a specific way of moving, it’s going to get eaten. But there are times when fish are locked into a specific pattern. This is where realistic fishing lures can help. LunkerHunt Swim Bentos exactly match a wide variety of small prey fish. What is a Realistic Fishing Lure? Realistic fishing lures match the same shape and size of what fish are eating at the moment. But they have one extra ingredient and that’s their color, surface pattern or body shape. For example, I saw newly hatched frogs in the water, called pollywogs. The pollywogs were black with a round head. I had some Berkeley PowerBait Mice Tails on hand. They were pink with a white head and were about an inch larger than a pollywog. They were the wrong color and the wrong size. But they matched the shape of the pollywog exactly! 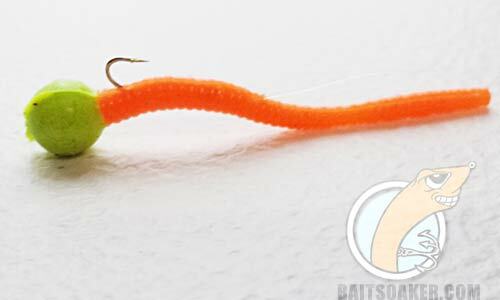 A PowerBait Mice Tail lure can imitate the realistic shape and action of a number of prey. So I put a hook in it, added a little split shot, then cast it out. Darn near every cast caught a rainbow trout. Why? Because the trout were focused on the round head/skinny body pattern. As far as the trout were concerned, it was a realistic match for what the trout were eating. A realistic lure isn’t a lure that looks exactly like what a fish is eating. A realistic lure is one that features a pattern that has a general match for what the fish are eating. There is no need to match the exact lure of a bait. Irregularity in color pattern to avoid showing the fish a single block of color. Sparkles or specks break up the solid color of a lure and make it look more natural. 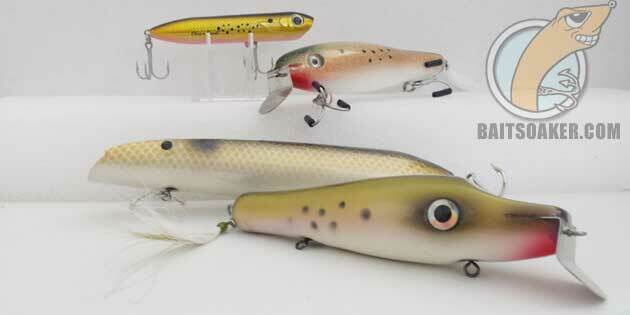 Four different lures designed to match menhaden, commonly known as pogies and bunker. Lures in these colors have been known to catch more striped bass than lures in different colors and patterns when striped bass are feeding on menhaden. Fly anglers like to talk about matching the hatch. But there’s an additional dimension I call Matching the Hatching. What I mean by this is that it’s not enough to match the look of the bait fish (match the hatch). You have to match their movement (matching the hatching). The movement refers to any peculiarity in how the baitfish are behaving. For example, a hatching bug has an upward movement. It starts at the river bottom or lake bottom and moves up. So fish move with a darting motion, while others move slowly. The up and down movement is a deadly lure presentations. When trout and bass are focused on eating hatching bugs, they will hit them as they are rising up. So jigging a realistic lure so that it has that upward movement will trigger the fish to hit it hard. That’s matching the movement. In saltwater, needlefish tend to suspend with no wiggling action. Someone invented a lure that was called a needlefish. It had zero movement. It just floated like the piece of wood that it was. But anglers discovered that it caught a lot of striped bass at night. Why? Because fish tend to sneak around without at night without making a commotion. The needlefish lure was matching the hatching. I have used the Spro McStick to catch a variety of fish. I have used the McStick lure to catch largemouth bass, smallmouth bass, two 15 inch brook trout, brown trout and countless rainbow trout. Lures with a minnow profile are highly useful for catching many kinds of fish. Fishing at night, whether in saltwater or freshwater, the biggest mistake anglers make is creating a lot of noise. That is the most unnatural way to present a lure. At night, all critters are moving slowly. They are trying to keep from drawing attention to themselves. At night, all fish, predator and prey, are creeping around. If they had toes they would be on tip-toe. If you’re presenting bait in a realistic manner at night, this means making your lure “sneak around” as if it’s trying to hide. When the temperature hits a certain point, bugs begin changing from nymphs to flying insects. The bugs begin a journey from the bottom of the lake or river and as they bubble up they shed their protective covering (called a shuck). When they reach the top they kick off their shuck then fly away. Trout like to target these nymphs as they are floating up toward the top. Sometimes they sip the bugs off the top, but most times they’re hitting the bugs under the water. Fly fishermen know that if trout are eating nymphs of a certain size and body form, they’ll catch trout if they show a fishing fly that matches that same pattern. For example, some nymphs have little tails in the rear and a tiny wing sack on their backs. So the fly fishermen will tie on a matching fly of the same size and general outline as what is hatching. Color is important, but not as important as the size and body pattern of the lure. 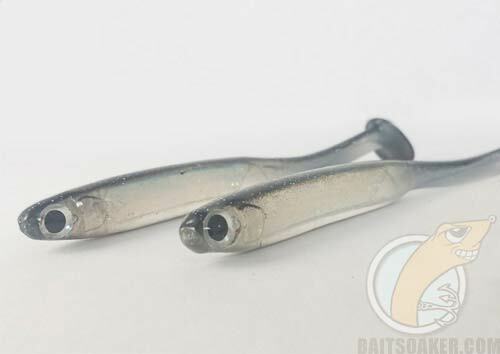 Matching the hatch is the reason why your minnow lures might not catch fish in certain rivers. When fish are focused on eating a specific kind of food it’s hard to pry them away to chase down another kind of food. So what do you do if you’re not a fly fisherman? One powerful option is to catch trout with small soft baits. Another technique is called the Float and Fly. This is a strategy where you use a float and instead of a worm at the end of the leader you use a fishing fly. In brackish estuaries and rivers, when the temperature starts to drop in the fall, herring and other juvenile fish begin to migrate out to the open ocean. It’s good to know what baitfish are around because even if your soaking bait, it pays to use the right bait. If the fish are feeding on mackerel, then use some mackerel as bait or else use lures with a mackerel pattern. Your catch rate will go way up. It is during these “hatching” events that it pays to know what is being born, what is traveling, migrating, what is mating and what predators are there to eat them. Once you know what fish are eating, you can make a smart decision on the type of lure to use. Fish that are older and bigger have more experience and tend to be pickier. They ONLY eat under limited circumstances. Which is why to catch the big fish, you have to fool them at might, under rough water conditions where they can’t get a good look or by using bigger lures. Big fish like big meals. When I say that a lure is realistic, I don’t mean that it looks exactly like a baitfish or insect. By realistic I mean a lure that takes an extra step to match a specific prey. Some lures are impressionistic. This means they don’t look like anything specific but do exhibit a general pattern that can make it seem like something the fish are looking for. 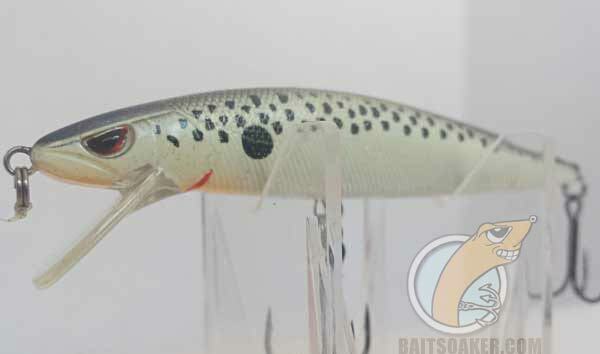 Realistic lures have that extra detail that make them appear to be a specific baitfish or bug. This is a good thing when you know what the fish are eating. 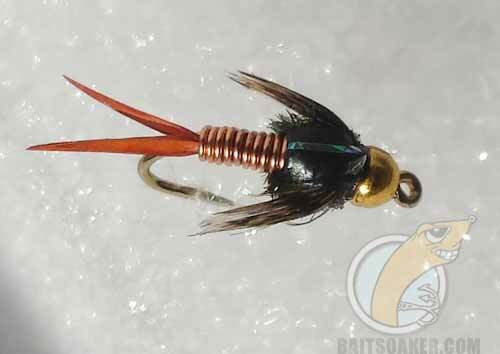 The Copper John Fly, invented by John Barr in 1996 is among the most successful fly patterns. The Copper John Fly is among the most successful fishing flies. The reason it catches so many trout is because it’s pattern resembles a variety of insects in nymph form that are about to hatch into a flying insect. It has wing pads, a tail and legs that help it match a pattern that trout often look for. The copper wire helps the fly sink in faster current in order to reach trout that are resting at the bottom of a river. Subscribe to BaitSoaker Newsletter - FREE! Never miss an article. Receive an email alert for new articles plus EXCLUSIVE fishing tips! 2 Comments on "When to Use Realistic Lures to Catch More Fish"
How do you use the COPPER JOHN FLY with a spinning rod? Or is it just for fly fishing only? That’s a good question! The Copper John is a fly fishing fly. However, all fishing flies can be fished with a spinning rod, too. Because the Copper John is heavy, it would be possible to cast it out with an ultralight fishing rod, using four pound test or even 2 pound test line if you’re on a smaller creek. A Copper John in a size 10 hook should be heavy enough to cast on an ultralight rod and if you’re on a smaller creek, you can go down to a size 12 hook. Another way to fish it is a technique called a Float and Fly. This is basically exactly the same as fishing a worm beneath a bobber. You use the smallest float you can get away with and tie a leader of the thinnest fluorocarbon or mono you have. Four pound test should be enough. Then cast it out and let the current drift it. The Copper John, in my opinion works best in situations when you need something in a faster current.